The height of fashion for people who have more important things to do with their hands than clutching a purse strap. I don’t get the thrill some women get from “designer handbags.” For me, my purse is just a place to carry stuff I might need while not home. At one time, I carried a much bigger purse, laden down with all sorts of seldom-used extras (including a pulley and a rubber scorpion), but then I had a baby. Carrying that baby simultaneously with a diaper bag and a purse was a little too much for me, so I downscaled to a very small bag that I could fasten around my waist. Ahhh, much better! Eventually the baby became a toddler and didn’t need to be carried anymore (refused to be, actually), and eventually the toddler stopped using diapers, so that bag was no longer needed. My hands were free again! But I had grown accustomed to the freedom a belt purse allows. Though I sometimes slung it over my shoulder and carried it like a traditional purse, I quickly grew annoyed with it slipping off my shoulder, so back around my waist it would go. And that’s what I’ve been doing for over ten years . . . with the same purse. Getting a new purse now was not motivated by the desire to be more fashionable, nor was it because my old purse had worn out. It was still going strong, actually. My big motivator was that I needed more room. I upgraded to a new cell phone last year, a wonderful HTC smartphone, and I’ve struggled with how to carry it ever since. Back in my dinosaur phone days, I had my phone clipped to my purse by way of an open-faced leather case. But I’m not aware of any such product being made for smartphones, so I had to keep my phone in my tiny purse. It fit, but just barely, and I found myself always having to rearrange the contents of my purse to get everything back in whenever I used something. 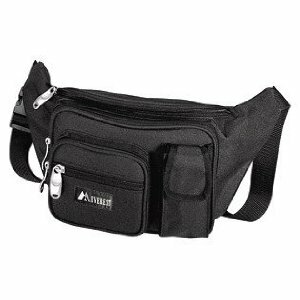 Finally fed up with that, a few days ago I ordered a new belt purse (or, as they are sometimes known, a “waist pack”; I refuse to accept the term “fanny pack”). It’s not much bigger than my old purse, but it has two main compartments, whereas my old purse only had one. Now I can put my most-used items (billfold) in one compartment, and my less-used “survival” equipment (nail clippers) in the other. Best of all, there is a separate pouch on the front for carrying my cell phone! So now it doesn’t have to compete for space inside the main part of the purse, and I can get to it more easily when I need it (and maybe I’ll actually hear it ringing now, which I rarely could in my old purse). A second compartment in the front will be for my lip-gloss and tissues. I’m in organizational heaven! Of course, despite their practicality (or maybe because of it) belt purses are not fashionable—except while rock climbing, when they are very fashionable. But I’ve never been one to let fashion dictate what I wear, much less what I carry. Besides, life can take unexpected turns. You just never know when you might have to climb some rocks. Sometimes you just need to have your hands free. This entry was posted in Miscellaneous, Money, Values. Bookmark the permalink.